We recently worked with the fine folks at Pure Stroke Golf in their innovation efforts. The company wanted to expand on their product line by developing another product to help golfers improve their game. Pure Stroke Golf is an Oklahoma-based small business with only a handful of employees, but they have a desire to grow by developing innovative products. Pure Stroke Golf was a one-product company. The product is a putting training aid. This product is simple, unique and effective in helping golfers improve their putting stroke. The owners wanted another product to go with the training aid. We utilized techniques from the exclusive System of Pi™ (Profitable ideas). We generated a few ideas and settled on pursuing a portable practice hole. We believed the portable practice hole would be an excellent complementary product to the putting training aid. We did some research to validate the concept and help us in the design and development phase. Our research showed that most portable practice holes were made of plastic and were not very durable. We also found that golfers complained that the practice holes slid around when the golf ball entered the hole. We solved these issues by using one-half-inch thick aluminum as our raw material for durability. We designed the base of the hole to have grooves. The grooves grip the carpet or practice putting green and prevent the hole from sliding. We made the hole diameter smaller than a regulation hole. This helps the golfer with putting accuracy. The ramp angle is designed to help the golfer maintain proper speed or pace of their putts. 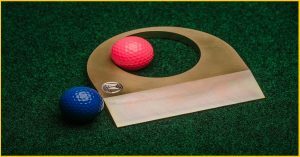 After just a few months, sales have been made to many individuals and a new distributor recently started carrying the portable practice hole. Corporate-type customers have been buying the holes to use as gifts for their customers and clients that happen to golf. This has all been accomplished with a rather limited marketing budget in terms of time and money, which is very typical for small businesses. The portable practice hole is an innovation by an Oklahoma small business that fills a need in a niche market. The innovation also helped Pure Stroke Golf expand their product line and grow their revenues. They plan on having more product innovations in the future. Let us know how we can help you in your innovation efforts.